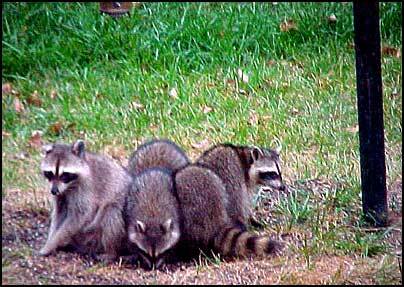 When we lived in Mississauga we had the odd racoon happen along so we decided to put out a peanut butter sandwich. Well soon two lagre females appeared & the feeding continued daily , but these two didn't get along & would his & chase each other off! later that spring they both had litters & they brought back the bebies & would co-op so if one group fed the others would wait.Then the babies would feed as a large goups form both litters. & as the young got bigger some wouldn't leave but camp out in the tree limbs & wait till the feeding time! They would come right up to the glass like they should be knocking on the door to say "Hey wheres my sandwich?" All animals have an internal clock & can be conditioned to use it when its to their advantage! The feeding for both families was so good the 2 females became tolerant of each other & when the babies became independant they too where co-op of each others proximaty! We fed them all summer till we moved away , but we had a large dog & they would give him the wide berth , but when the dog was inside they would come right up to the glass nose to nose with the dog & display no fear like they knew the glass meant their safety! We figured it out to feed 15 racoons 2 loafs of peanut butter sandwiches per day was $120. per month! But it sure was interesting Certainly better than watching TV! fear of wild animals makes me laugh as people who don't know think they are all infected with rabies.........???????? Hasn't been a reported case of that for decades! When i lived in Northern Ontario the trappers said the very odd rare case of mange but nothing ever they come across year after year. No racoon beyond the Soo & they boreal forests know no such thing as racoons nor skunks! Would just like to point out that a fear of wild animals is not necessarily a bad thing. It's called a "healthy fear" for a reason. I don't know if you have seen the damage a raccoon can do? Both to other animals and household items. I have. Up close. They rip things apart very easily. The rabies thing I don't feel that is such a bad thing either. I know there hasn't been an outbreak, as you call it, of rabies in years. I know the chances are slim to none but I would rather be safe than sorry. At least in the situation I find myself in now. Hi welcome to the forums, I rehab wild life and release them far from homes and residential area's if possible (depended on what the animal is)they are cute little buggers and fun to watch but I try not to encourage raccoons to the yard, they get too used to humans and that usually ends bad for them, like the new owners of your home...if they don't think its as cute?....I see traps in their futures. I have no fear of Raccoons, but they do carry various diseases that could be detrimental to pets and humans for that matter.....Even though rabies is not running rampant among them apparently distemper is. Ingestion of their feces by a small child can be very serious. I too made the mistake of feeding Raccoons for a long time,yes,I loved watching them,the babies are absolutely adorable. I learned my lesson though and although I really love them(like any other animal)I pulled down the blinds on the patio-doors,so I would not have to watch them looking for food and eventually they stopped coming. Great, hopefully now these animals that you conditioned as their food source, hopefully they were able to fend for themselves. Yes, it is entertaining and cute to feed wildlife, but they are wild animals. Don't get me wrong, I agree with intervening with a wild animal that looks sick and or injured. But as for healthy wildlife should be left alone. Wildlife should be afraid of humans. And just because there has not been a rabies case reported in awhile, you should still be extremely cautious. Last edited by NoahGrey; April 7th, 2010 at 05:51 PM. Hasn't been a reported case of that for decades! Oops, make that 93 raccoons. It was 71 as of March 15. Thanks for the info Sugarcatmom. Last edited by NoahGrey; April 7th, 2010 at 05:54 PM.